This short from Edison is no big deal today, but it’s interesting because of its use of a simple technical advance that was pretty rare at the time. Unfortunately, we have no information about the crew on this film. 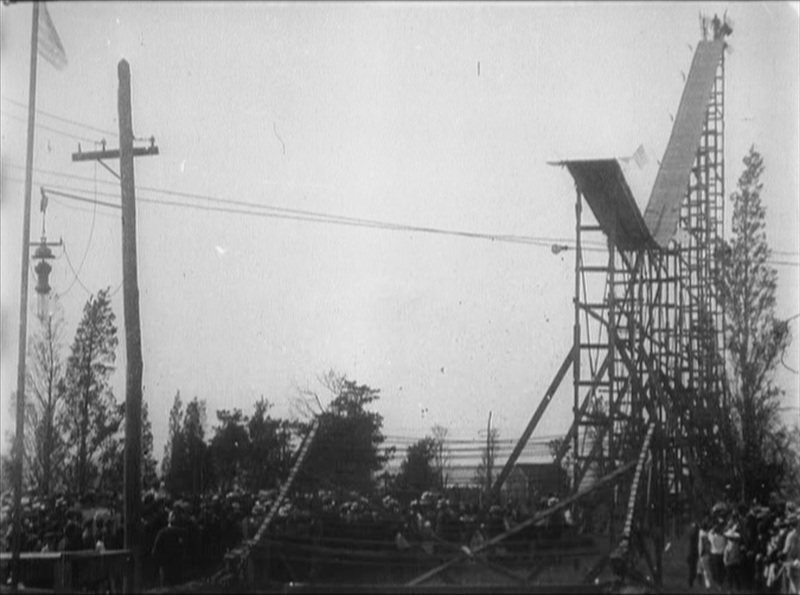 We see a tall ramp, positioned to the right of the frame. A nearby telephone pole gives us a sense of scale – this is a very high ramp (at least two stories tall). After a bit of anticipation, we see a male figure at the top of the screen, and suddenly the camera tilts slightly downward, so we can see the large tub of water he will land in. He swooshes down the ramp on a bicycle, flying off the bike at the bottom of the ramp and soaring through the air to splash down into the tub. The camera now pans left, so that we can see the platform where he climbs out to give a bow. The really exciting part of this movie is the camera movement. I’m not certain that this is the earliest example we’ve seen of a combined tilt and pan, but it’s definitely been pretty rare up to now. In fact, most of the early Lumière “panoramas” (from which we get the word “pan”) are actually tracking shots, taken from railroad cars, wagons, or elevators. Actually being able to pivot the camera on its tripod while shooting was a pretty major innovation; I wouldn’t be at all surprised to learn that it happened before 1901, but we do have a very early use of it here. What’s especially interesting is how the anonymous camera operator has carefully anticipated the subject’s movement and kept him in frame. Presumably there was no rehearsal, so this is a good example of documentary or newsreel technique. My final observation is that the daredevil in this movie made me think of Douglas Fairbanks, not in terms of his facial appearance (the camera is too far back to see his face), but in terms of his body language. Particularly the flourish he gives at the end when he bows came across to me as very Fairbanks-ian. This footage is actually pretty thrilling. I watched it twice in a row and you’re right about the camera work. It’s quite clever in how it anticipates the movement and is ready for it. It is impressive, given how new the process was.